Not losing your job can be stressful too! Being made redundant, or even the fear of losing one’s job, can lead to stress, anxiety or depression. But what about the colleagues left behind after a company has made cuts to its workforce? According to psychotherapist and counsellor Geoff Miles, employees who don’t lose their jobs might be as much in need of therapy as those who do. Geoff and Helen Payne-Kumar, whose company See For Miles Ltd, have just moved into new premises in Marlborough, say workers who remain at their desks after redundancy are likely to feel anxious about their own job security, stressed because they are picking up the workload of their former co-workers, and even guilty that they held on to their jobs while colleagues were shown the door. Over nearly 40 years, Geoff has developed counselling techniques which can be delivered to employees in the workplace, or at a neutral off-site venue, helping them to become more productive. Geoff has also seen an increase in the numbers of people coming to him for counselling – and says the economic conditions and accompanying financial concerns are a huge contributing factor. Even children are feeling more pressure. One of See For Miles’ most popular courses is delivered in classrooms to students about to sit exams. 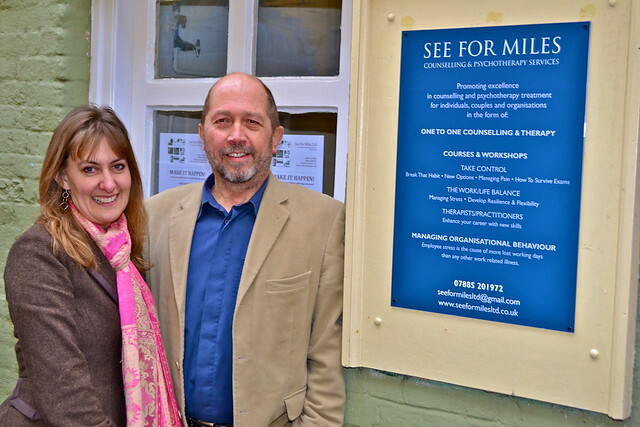 The new See for Miles offices at Old Hughenden Yard in Marlborough offer a quiet contemplative space for groups, couples and individuals. There’s even a video conferencing facility where Geoff can talk to patients via the internet – a service one of See For Miles’ clients – who lives in Australia – finds particularly useful. And the next step for the company is to build a network of consultants who can deliver those courses all over the UK. For more information log on to www.seeformilesltd.co.uk or call 01672 511043.